Be it Easter brunch or dinner special, announce it in an exciting way using the eye-catchy Easter flyer designs. These lovely Easter flyers display elements such as Easter egg that gives the feel of the festival. The Easter templates feature an array of bright and vibrant colors that adds cheeriness and liveliness to the flyers. Make every visitor tempt to attend your Easter party and Easter event with the wonderful selection of the Easter flyers for cafes and restaurants. They are fully editable, so you make alter them as per your needs. Moreover, these fine-looking flyers are downloadable for free of charges! 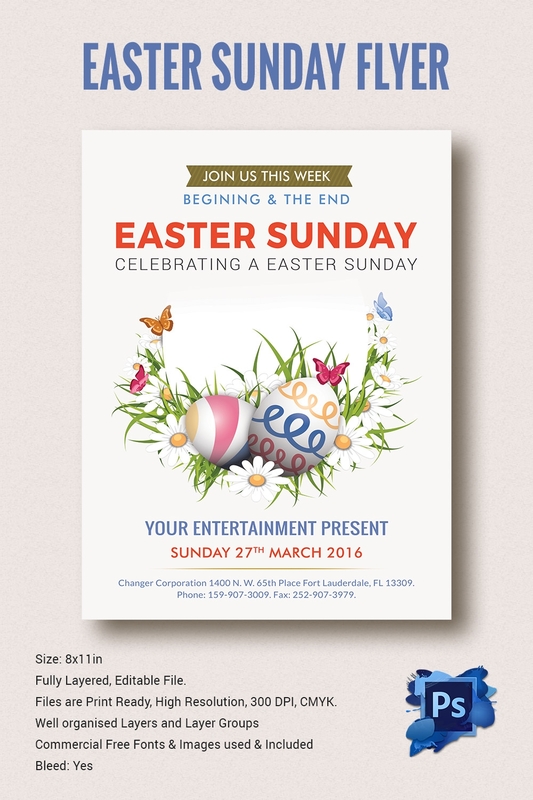 Use the ready to print Easter Sunday flyer to publicize about the Easter events and parties in an exciting manner. 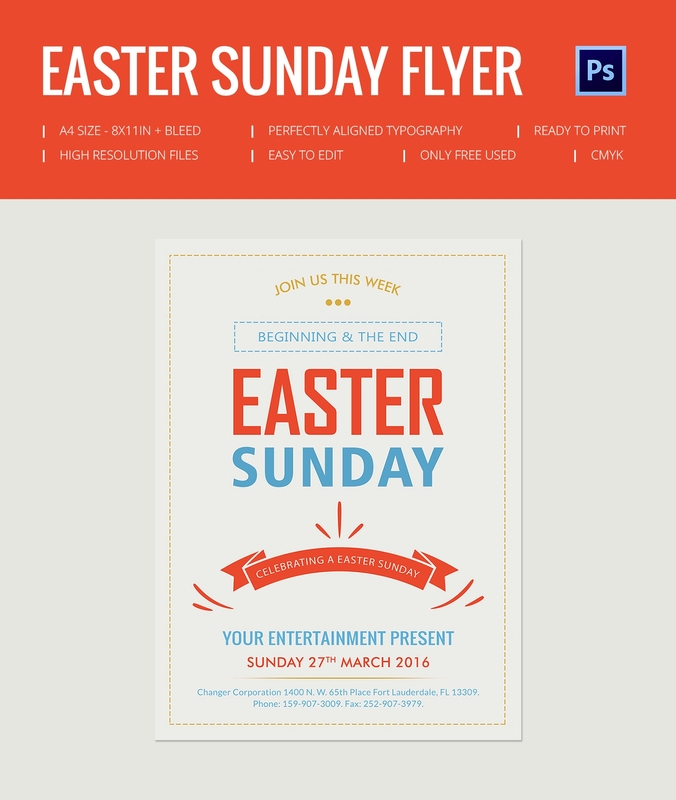 The white flyer with attractive orange header will tell all about your Easter Sunday plans and the aligned typography gives the content printed on it an eye-catchy appearance- download it for free today! Announce Easter function organized by church with the attractive Easter Sunday flyer. 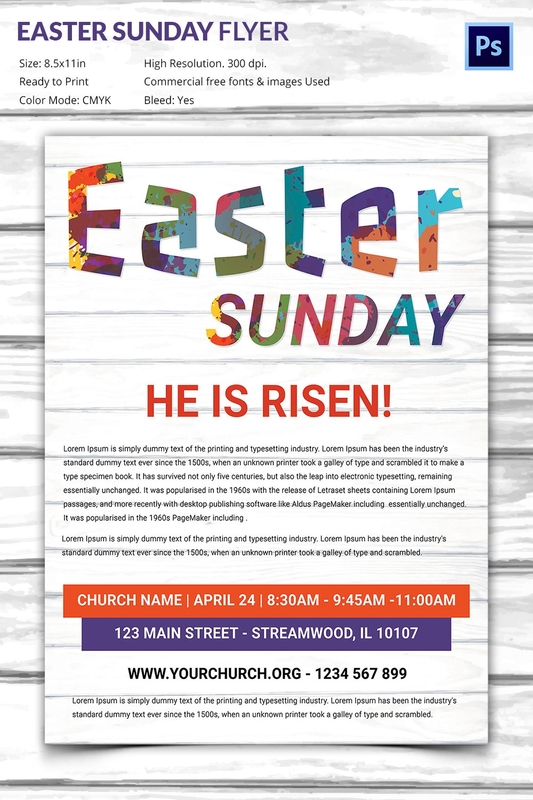 This ready to print Easter flyer lets you add information such as church name, date and time related to the function or event. The white background of this Easter template gives visibility to the text imprinted on it. 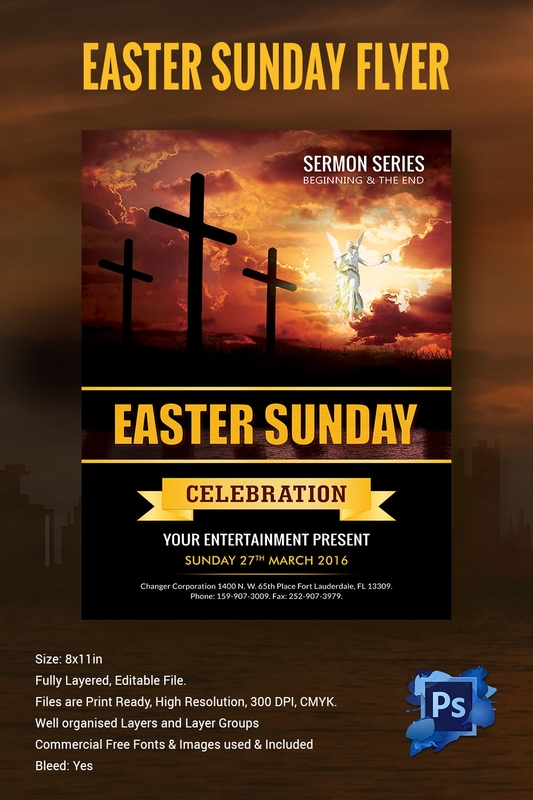 If you are looking for unusual flyers for Easter then this Easter Sunday flyer with the dark background is the right one for you. This exceptional Easter template will give an entirely new outlook to the flyer that will definitely grab the attention of the visitors. It features well-organized layers to offer a brilliant Easter flyers for effective results. Use the bright colored Easter Sunday flyers to showcase the happiness and excitement that this festival holds up. It features a beautiful floral design with butterflies and Easter eggs, which will surely have a good impact on the viewer. You can add details such as venue, dates, time, etc on this stunning Easter Sunday flyer to attract everyone to discover what’s waiting for them!